and the thank you pictures arrive!!! but IT's SO FUN to see some of them together!! with PINK or BLUE fabric. What are YOU making this week??? I had NO idea I'd have it finished ALREADY! The binding is even ON! 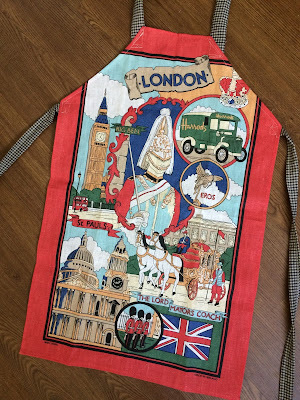 I also finished this tea towel apron. practical memory of a great city!! 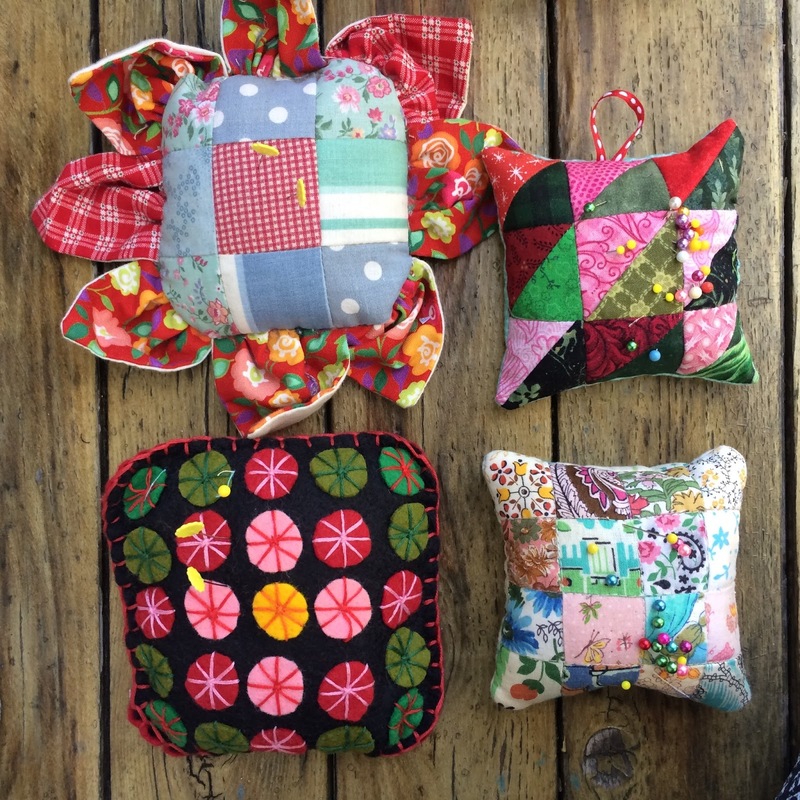 These are a few of my favorite pincushions. Well loved and USED often!! Everyone was home this weekend. 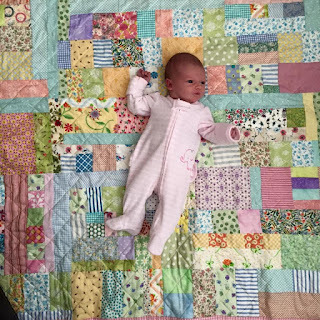 I finished a baby quilt this week. 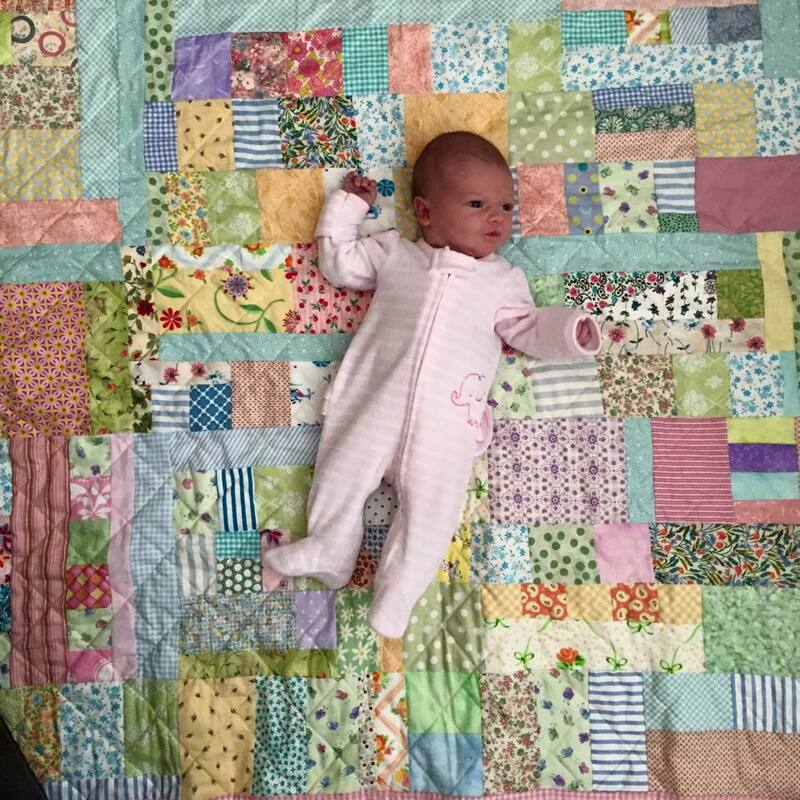 You know I LOVE baby quilts!! and they got SPECIAL treatment!! was all it took to make this quilt EXTRA special!! EVEN the backing was folded up and Ready! I packed some scraps and enjoyed making string blocks! I also enjoyed some outside games! 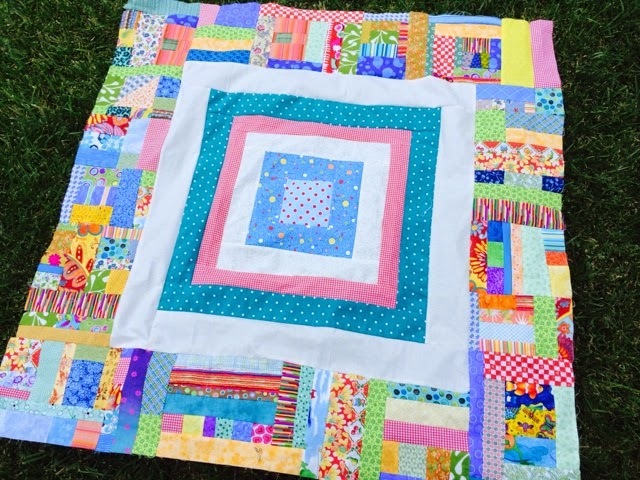 I hope to finish this simple baby quilt. The baby is almost here!!! 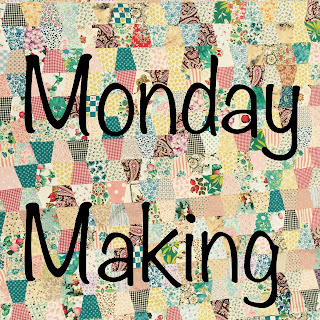 What are YOU making this week?? Being a grandma means I get to make some of these. I DO love baby sweaters!! There's also the SIZE.....ha ha!! Is seeing the little one WEARING IT! 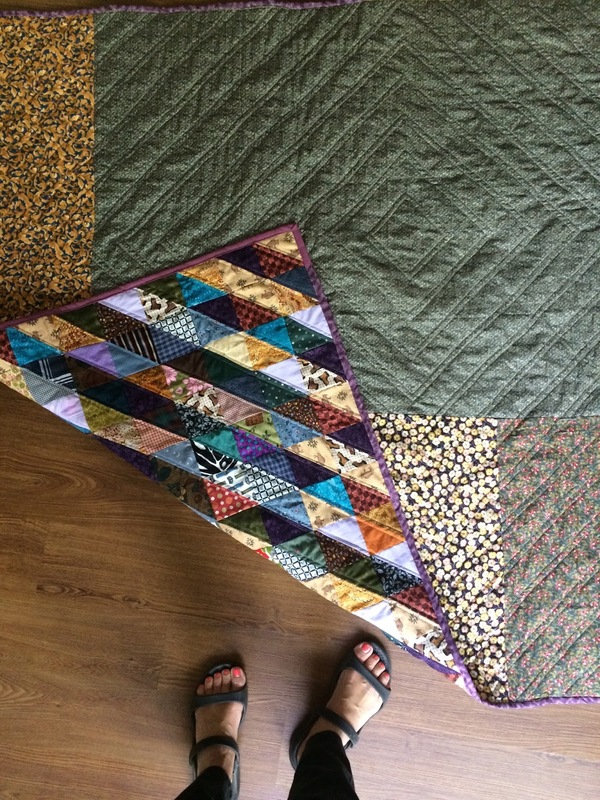 I also finished this half square triangle quilt top this week! It was a FUN challenge working on my color VALUES!!! It also contains quite a bit of purple. Not one of my TOP colors. I do like the design. Not quite small enough to HIDE the ugly fabric. 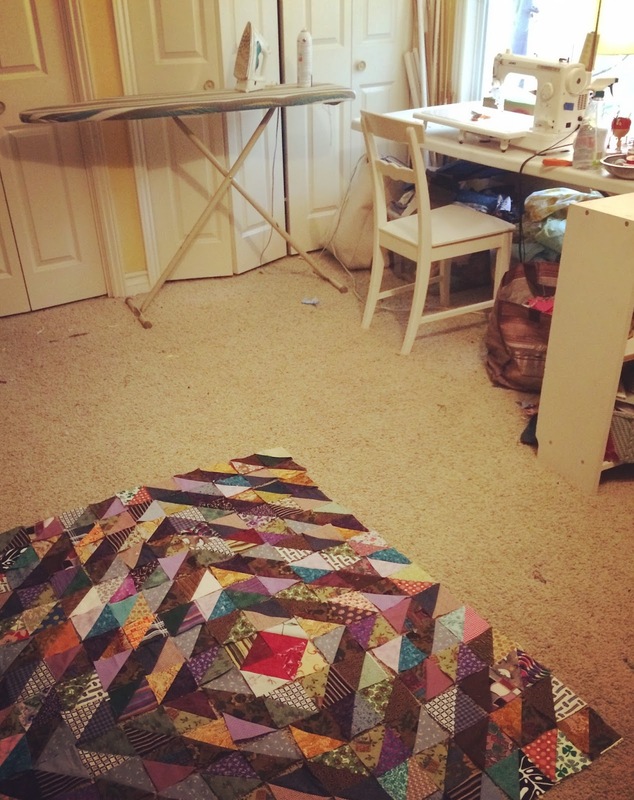 I am currently sewing half square triangles. as the quilt grows and grows!!! 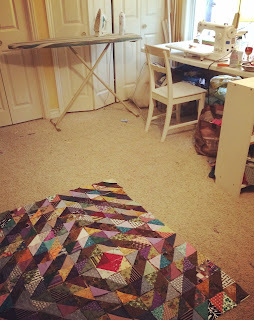 This quilt contains SO many ugly fabrics. Look close and you'll spy them. Each half square triangle block is 3 1/2". It seems to save time and FABRIC! I am still making broken dishes blocks. it will take quite a few to make a bed sized quilt! It's fun to SEW while CAMPING!!! I will also be working on a couple more "ships" this week. and I hope to WIN one of these months!! !